Ambroise-Paul-Toussaint-Jules Valéry (October 30, 1871 – July 20, 1945) was a French poet closely associated with the Symbolist movement who is often considered one of the greatest poets of the twentieth century. Valéry's output as a poet was remarkably small—he produced little more than one hundred poems in total—and he only came to poetry relatively late in life, at the age of 46. Prior to achieving success as a poet, Valéry had spent decades writing variety pieces for local publications on a wide array of topics, such as philosophy, politics, architecture, painting, dance, languages, and science. Valéry harbored a life-long fascination with science and mathematics; he would write a lengthy monograph on his hero, the artist/inventor Leonardo da Vinci, and every day of his adult life he would write incredibly learned entries in his notebooks on the subjects of science and philosophy. Valéry's poetry was infused with the breadth of knowledge and depth of insight one would expect from a writer with such a wide range of interests. In addition, Valéry was a notorious perfectionist; like a scientist laboring in a laboratory, he would write and re-write his poems relentlessly, sometimes spending years on a single poem. As one of the most accomplished of all the Symbolist poets, Valéry would have a major influence on the emerging Modernist school, and such major figures as T.S. Eliot and Ezra Pound would cite him as an influence. Valéry was born in Sète, a town on the Mediterranean coast of the Hérault. He was raised in Montpellier, a larger urban center close by. After a traditional Roman Catholic education, he studied law at university, then resided in Paris for most of the remainder of his life, where he was, for a while, part of Stephane Mallarme's circle. During this time, Valéry attempted to write a handful of juvenile poems, which many of his associates, including Andre Gide and Mallarme himself, praised highly. Valéry, however, continued to be dissatisfied with his output, and he would later disown many of his early works. In 1892, Valéry experienced a severe emotional breakdown; apparently, a woman Valéry had been deeply infatuated with rejected his advances. Deeply distraught, Valéry resigned himself to a life of the mind; he took up his habit of writing daily entries in his notebooks, began a quiet career as a secretary, and largely abandoned his attempts at poetry. 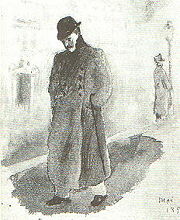 Andre Gide continued to pester Valéry, pressing him to resume work on his poetry and, after nearly twenty years of inactivity, in 1912, Valéry resumed work on the poem, La Jeune Parque Valéry spent five years revising the poem, finally publishing it in a small volume, with a handful of his other poems, in 1917. The volume would rocket Valéry to almost instantaneous fame. Valéry continued to put-off writing full-time, only beginning at the age of 50 to devote all his energy to writing, after the man for whom he worked as private secretary, Edouard Lebey, died of Parkinson's disease in 1920. Prior to that time, he had earned his living first, briefly, in the Ministry of War, before assuming the relatively flexible post as an assistant to the increasingly impaired Mr. Lebey, a job he held for some twenty years. After his election to the Académie française in 1925, Valéry became a tireless public speaker and intellectual figure in French society, touring Europe and giving conferences on cultural and social issues as well as assuming a number of official positions an admiring French nation eagerly offered him. He represented France on cultural matters at the League of Nations, serving on several of its committees. He gave the keynote address at the 1932 German national celebration of the 100th anniversary of the death of Johann Wolfgang von Goethe. This was a fitting choice, as Valéry shared Goethe's fascination with science and the two writers had been often compared. In addition to his activities as a member of the Académie Française, he was also a member of the Academy of Sciences of Lisbon. In 1937, he was appointed chief executive of what later became the University of Nice. He was the inaugural holder of the Chair of Poetics at the College de France. The Vichy regime stripped him of some of these jobs and distinctions because of his quiet refusal to collaborate with it and the German occupation, but Valéry continued to publish and to be active in French cultural life, especially as a member of the Académie Française, throughout the war years. Valery died in Paris, in 1945. He was buried in his native Sète's "cimetiere marin," named from the title of his best known poem. as gazing on a peace the gods proclaim! and with what harmony is all imbued! time glitters and in dream lies certitude. vaulted with gold in countless sparkling tiles! Valery's far more ample prose writings, peppered with many aphorisms and bons mots, reveal a conservative and skeptical outlook on human nature, verging on the cynical. But he never said or wrote anything giving aid or comfort to any form of totalitarianism popular in his lifetime. Raymond Poincaré, Louis de Broglie, Andre Gide, Henri Bergson, and Albert Einstein all respected Valéry's thinking and became friendly correspondents. Valéry was often asked to write articles on topics not of his choosing; he collected the resulting intellectual journalism in five volumes, titled Variétés. Valéry's most striking achievement is perhaps his monumental diary, called the Cahiers (Notebooks). Early every morning of his adult life, he contributed something to the Cahiers, which prompted him to write "Having dedicated those hours to the life of the mind, I thereby earn the right to be stupid for the rest of the day." The subject of his Cahiers entries often was, surprisingly, science and mathematics. In fact, these arcane subjects appear to have commanded much more of his considered attention than his celebrated poetry. The Cahiers also contain the first drafts of many aphorisms he later included in his books. To date, the Cahiers have been published in their entirety only in photostatic reproduction, and only since 1980 or so have they begun to receive the scholarly scrutiny they deserve. 1964. Selected Writings of Paul Valery. New Directions. 1977. Paul Valery: An Anthology. James Lawler, ed. Bollingen (Princeton Univ. Press). 1989. The Outlook for Intelligence. Denise Foliot and Jackson Mathews, trans. Bollingen (Princeton Univ. Press). 2000. Paul Valéry's Cahiers/Notebooks. Volumes I- . Editor-in-chief: Brian Stimpson. Associate editors Paul Gifford, Robert Pickering. Translated by Paul Gifford. Frankfurt am Main: Peter Lang. This page was last modified on 6 October 2016, at 18:20.